Iraq Documentaries and Videos. PBS FRONTLINE. Iraq Guide. By National Geographic. Facts about Iraq. By National Geographic. Profile: Iraq. Journal of Mine Action. James Madison University. 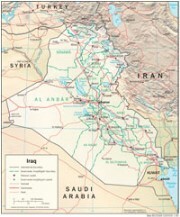 Iraq Country Brief. The World Bank. Harvard University. Iraq - Center for Middle Eastern Studies. Iraq Project. Institute for the Study of War. Iraq 101. By Mother Jones. Iraq Blog. Middle East Strategy at Harvard (MESH). Iraq News, Commentary & Analysis. World Defense Review. Archived Reports from the War. WBUR.org. Iraq War Weblog, Conflict in Iraq. Ethnic Groups of Iraq. Peoplegroups.org. Iraq Page. The World Bank.